Click here for a link to all the pictures for Sunday. 53 Latin students and 3 teachers boarded a Lakefront Lines bus at Summit and departed at 7:10 am on Sunday July 27 for the 2014 National Junior Classical League Convention at Emory University in Atlanta, Georgia. Students had so much luggage, so many projects, such big boxes of t-shirts and other goodies to sell at the bazaar that the driver barely fit everything in storage under the bus. Julia got the privilege of sitting behind her father. For the 1st time in 16 years, no movie was played for the whole bus. Why no movie for the whole bus? B/c students were able to watch whatever they wanted on their phones/tablets/etc. Will I miss the movie for the whole bus? Not really, especially after losing brain cells during a forced viewing of Mortal Kombat a few years back on the bus trip. But I will miss other movies for the whole bus – Monty Python’s Search for the Holy Grail, Star Wars, Raiders of the Lost Ark, the Toy Story movies. The bus broke down. 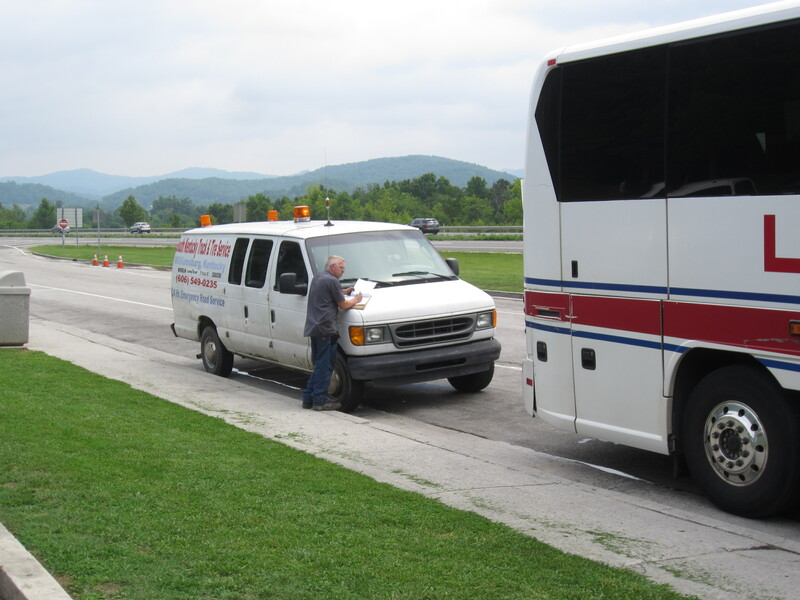 When we had stopped at a rest area just across the Tenn border, another motorist said to the driver, ‘You know the whole back of the bus is spray with oil, right?’ Well, the bus had lost practically all its oil, and I guess it was lucky that we happened to stop for a break. 90 minutes later, roadside service determined that someone had not reinserted the oil dipstick properly, and therefore the pressure caused all the oil to spew out through the opening. We refilled the oil and were on our way. Call IX-I-I, and Roadside Service will come 60 minutes later! Students pass the time at the rest area by playing some cards. Students spent a bunch of $ at the vending machines at the rest area. Private time in the corner in the vending machine room. The McAuley girls enjoy the ambiance of the vending machine room. People in the back cheered and clapped whenever anyone used the bathroom on the bus. There were many online chess matches happening. Some students sang about half of Bohemian Rhapsody by Queen [on a side note, Julia and I had recently watched the opening of the Wayne’s World movie together, with Wayne and Garth and the rest singing it in the car on the way to the donut shop]. We stopped around 1 pm for lunch. The choices: Taco Bell / KFC, McDonald’s, Wendy’s. I got the Chicken Littles at KFC and had lunch with Sarah Elmore, the Lakota West teacher and mother of 2 young kids, who is returning to the NJCL Convention after a hiatus of a couple of years. 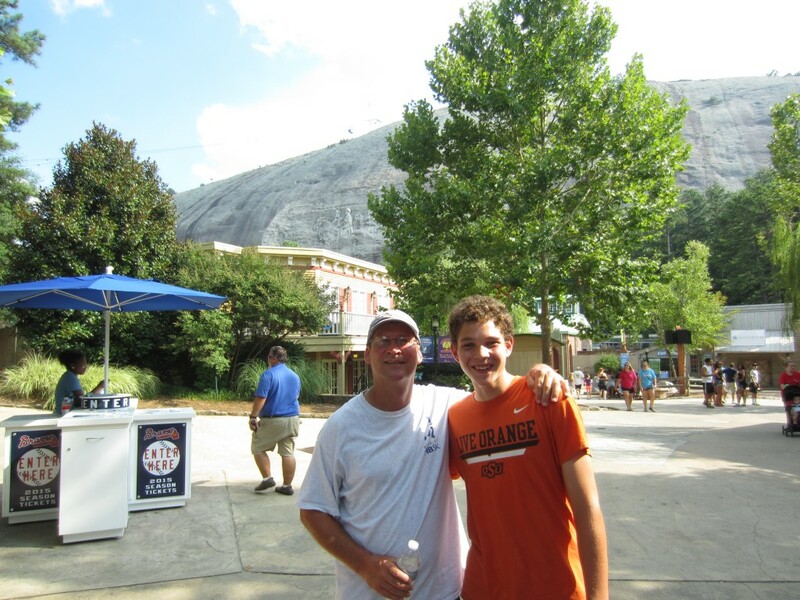 We arrived at Stone Mountain Park at 5. Thanks to Moeller teacher Brian Compton for the idea to stop at the park. Many did the 4 mile hike around and up and down and back around again. Some just hung out and enjoyed the day. No student – that I know of – did the SkyTram or the Ropes course or the WaterPark. The hike was long and very uphill – and then, of course, very downhill. It was hot and humid. 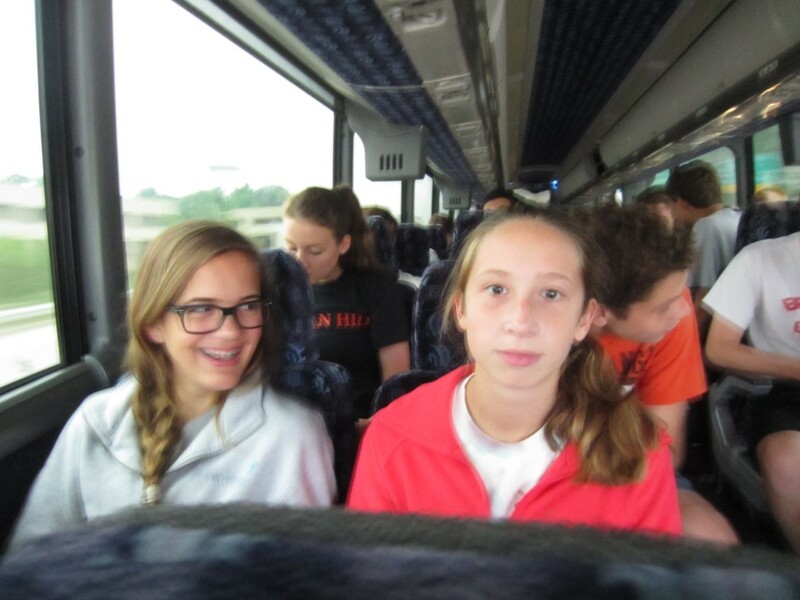 Click here for a video of the kids on the bus after the Stone Mountain experience. 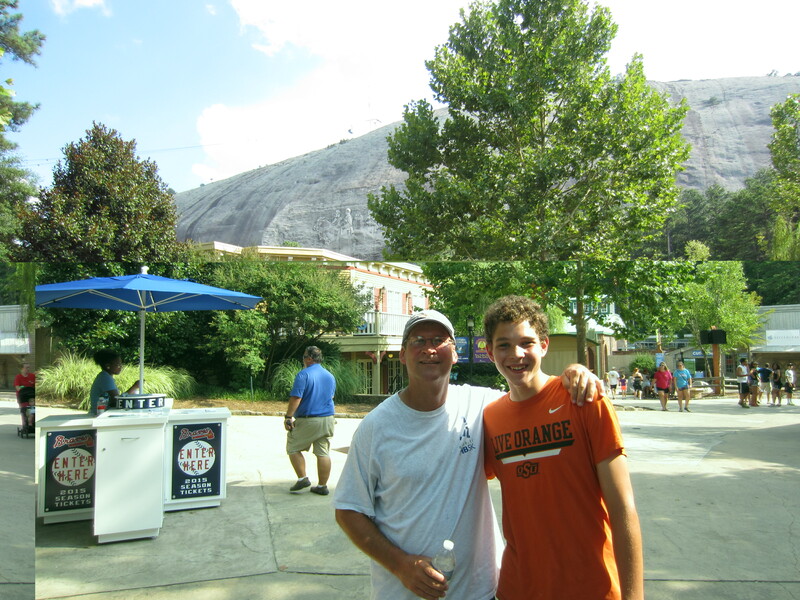 Conrad and his Latin teacher at the foot of Stone Mountain. The bus rolled into Emory University around 7:45. It took a while to unpack and get the stuff to the boys and girls dorms. Then everyone ate dinner at the dining hall and relaxed: some socialized, some played certamen, some threw the frisbee. There was a short fellowship of all the OH students at 10:30, and then everyone was on their floor by 11:30. The Cleveland group arrived during fellowship. Nora Murphy, 1 of the teachers at Shaker Heights, described almost missing the flight down to Atlanta b/c a fierce storm had caused widespread flash flooding in the Cleveland area. They had to zigzag their way to the airport to avoid flooded roads. 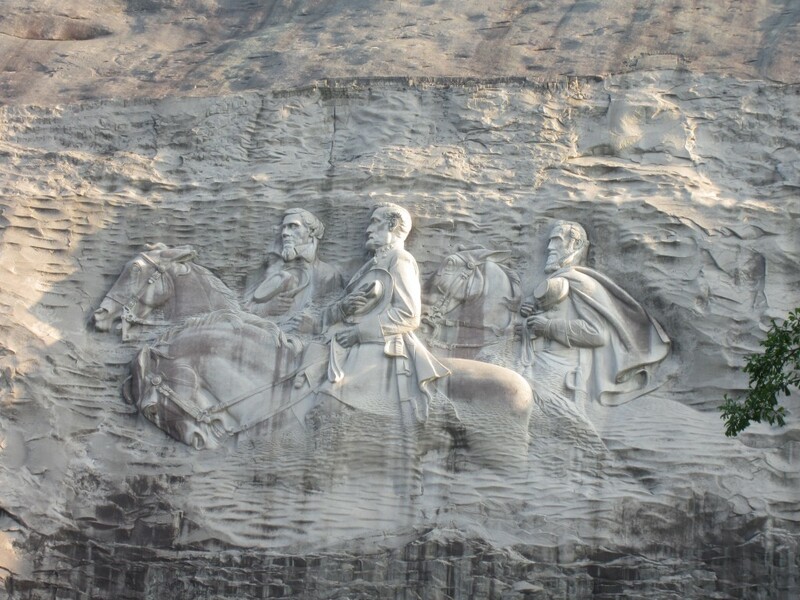 The Confederate Memorial on the side of Stone Mountain. 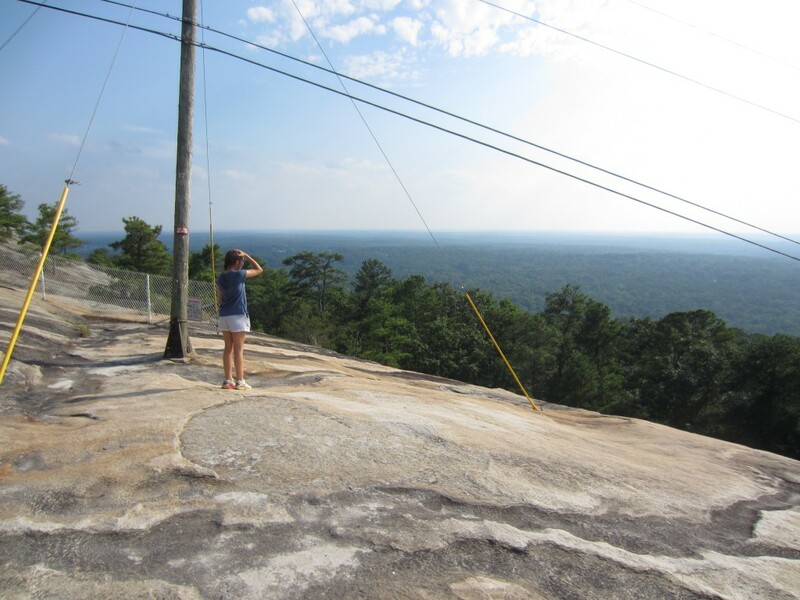 Hali takes a break from the climb and checks out the view.